A rainbow breaks out Wednesday in the distance behind center field. Rainbows are an interesting phenomenon. They are created when sunlight — cheerful, optimistic and hopeful — collides with raindrops — gloomy, pessimistic and possibly destructive. Also, they’re very pretty to look at, but they are an optical illusion. All show and no substance. 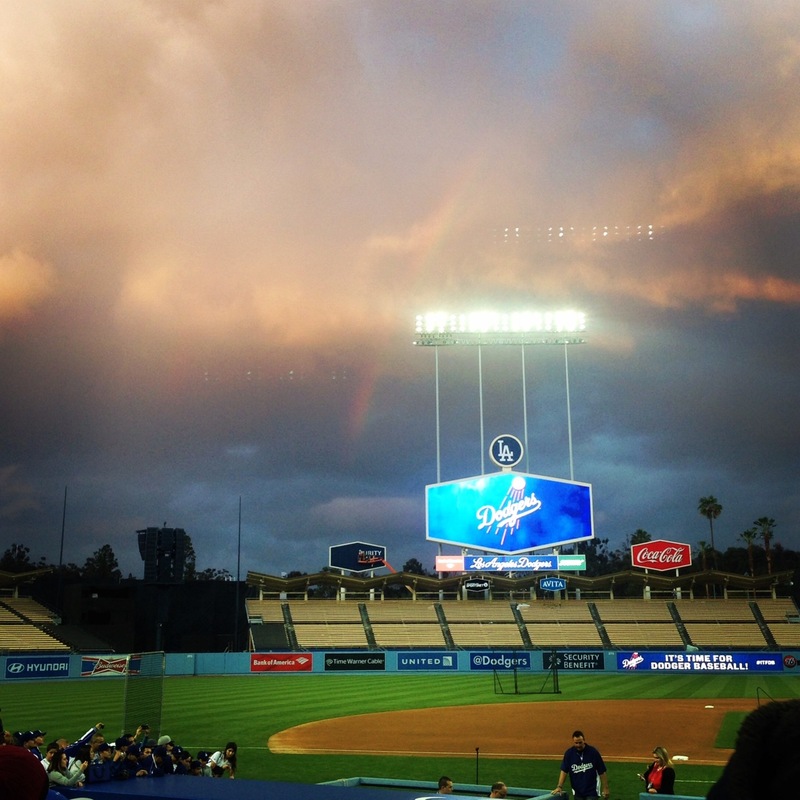 So the beautiful display past center field yesterday was a perfect metaphor for this season’s Dodger fan experience. The Penguin interacts with his fans. Season ticket holders, such as myself, were treated to a first look at the Field Level Concourse on Wednesday when we were invited to watch batting practice and a simulated intrasquad game at Dodger Stadium. It was fun to see what they have done to make the farflung netherworlds past left and right field into Party Central: new bars, True Blue BBQ and Tommy Lasorda’s Trattoria. 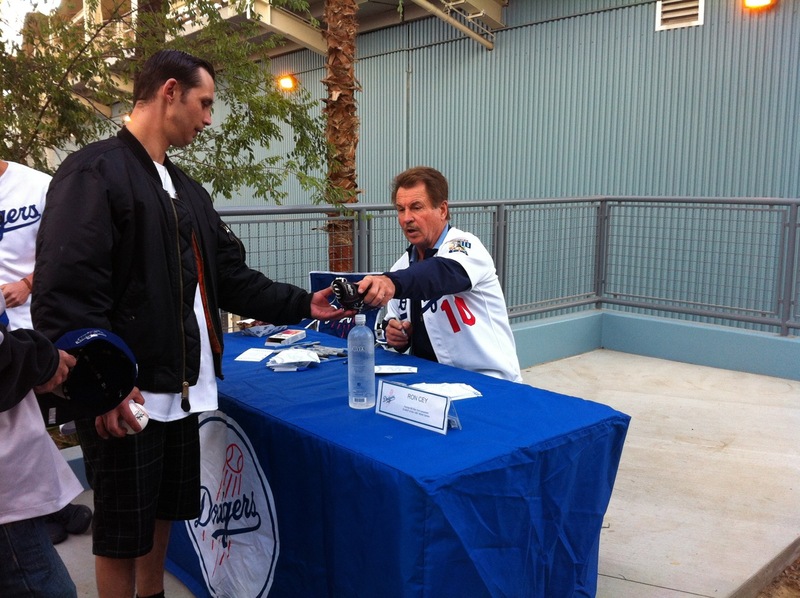 Dodger legend Ron Cey was there signing autographs. There are lots of bar-stool seating areas, especially around the two bullpens, so if you like to watch Brandon League or Brian Wilson warming up, you will have a place to set your beer while you do it. I’m not going to reiterate the whole “We Love the Fans” line the Dodgers spew while denying 70% of the households in Los Angeles the right to watch the games on TV. Chris Erskine wrote this beautifully stated diatribe on that situation in today’s L.A. Times. This guy has my dream job. But enough grousing. 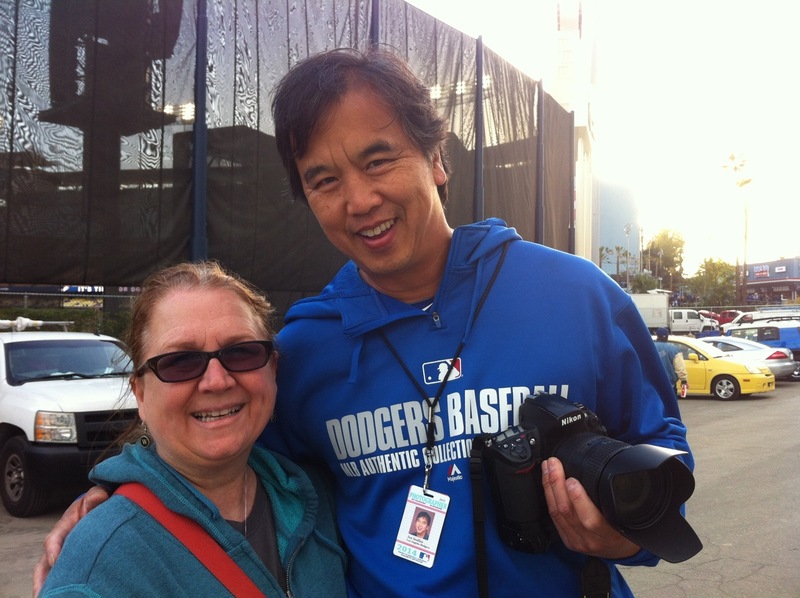 Two amazing things happened at Dodger Stadium last night: I met Jon SooHoo, the Dodgers photographer, whose work I so admire. Really nice guy who has the best job in the entire world. Also, I apparently won something, a “warm-up on the field for you and three friends,” but I have yet to hear from the Dodgers about the details. Just having won is amazing. In all the years I have been going to Dodger Stadium, and that is a LOT, I have never ever won anything before. It is a well-known fact that hardly any Top Deckers ever get giveaways or chances to win cars or anything like that. Those prizes go to the Field Levelers and Logers, who, because they fork over more cash to get “premiere seating and amenities,” are worth more than the working-class Joes up top. If this whole “warm-up on the field” works out, my problem will be selecting three Joes to join me. Any ideas?